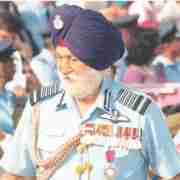 It was a poignant moment for the Indian Armed Forces and indeed for the Indian nation, when the Marshal of the Air Force, Arjan Singh passed away in Delhi on 16 Sept 2017, aged 98 years. Just two years shy of what would have been a remarkable century—one that the whole nation was praying for, MAF Arjan Singh was truly a man for all seasons — A soldier, statesman and perhaps one of the finest human beings this country has produced. Born on April 15, 1919, in Lyallpur (now in Pakistan) in Punjab in undivided India, his father, grandfather and great grandfather had served in the cavalry. He joined the RAF College, Cranwell, in 1938 and was commissioned as a Pilot Officer in December the following year. His bravery was second to none on the battlefield and for his exploits in the Second World War, he was awarded the Distinguished Flying Cross. In a colourful and eventful career spanning three decades, he flew over 60 types of aircraft, and also took part in the first fly past of Independent India on 15 August 1947. But his real test was to come in the 1965 Indo-Pak war, when as the Air Force Chief at a relatively young age of 44 years, he led a fledgling IAF against Pakistan, which had qualitatively superior aircraft. For blunting the Pakistani offensive, despite constraints on the full-scale use of air combat power, he was awarded the Padma Vibhushan, in 1965, the second highest civilian honour in the country. Marshal of the Air Force Arjan Singh will be remembered amongst the great in India’s pantheon of heroes, and lies in the same league as two other stalwarts— Field Marshal Cariappa and Field Marshal Sam Manekshaw. All three strode the military domain like colossuses and impacted the military with their leadership styles, strategic thinking, individual bravery and operational successes — truly the stuff that legends are made of. The humane side of the Marshal of the Air Force was revealed in very touching gestures which he exhibited all his life, amongst which was his giving away of all his personal savings worth Rs 2.5 crore for the welfare of ex servicemen. Truly a gesture born of the love he had for the Service and for the men he had the privilege to command. In life, he inspired the IAF to touch the sky with glory and through his vision and guidance, helped the IAF to grow into a modern fighting machine that today stands second to none. An epitome of military leadership, his mere presence in military or civil functions, lent an aura and dignity to the gathering because of his status and towering personality. His contribution extended to diplomatic and other important assignments as well. He was truly a man of many parts. On 18 September 2017, when the nation bade him a final farewell, there was hardly a pair of eyes that weren’t moist when he was cremated with full military honours. The IAF flew a missing man formation overhead as his funeral pyre was lit but though his body is no longer with us, his spirit and what he stood for will live on for ever. Farewell, Marshal of the Air Arjan Singh. We shall miss you. Air Vice Marshal CV Subramaniam is a veteran IAF officer who had the privilege of restoring the Marshal of the Air Force Arjan Singh’s personal documents. This obituary comes out from a deep sense of respect for the IAF’s finest Air Warrior.